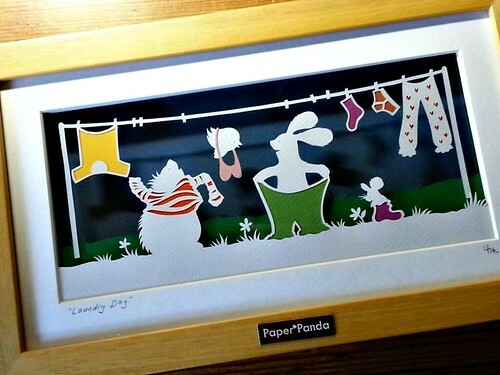 Artist Louise Firchau's Facebook page, Paper Panda, has a whopping 139,000 Likes which almost makes me hesitant to put up this post... perhaps you're already very familiar with her work. However, I can't resist sharing images of the joyful paper cuttings Louise creates with those of you who haven't yet been introduced. 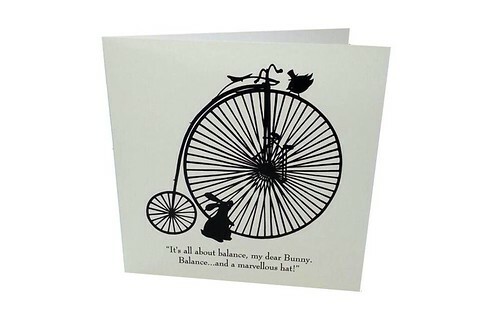 In a recent post on her blog, Louise, who is an avid reader, mentioned that the designs are often inspired by childhood books such as Alice in Wonderland and Brothers Grimm Fairy Tales. In fact she keeps a stack of books in her studio to refer to, but many other things prompt ideas as well... song lyrics, something she's read, or a printed design. Louise's life sounds as if it would fit right into one of her beloved storybooks, as she lives and works in England’s picturesque Cotswolds. 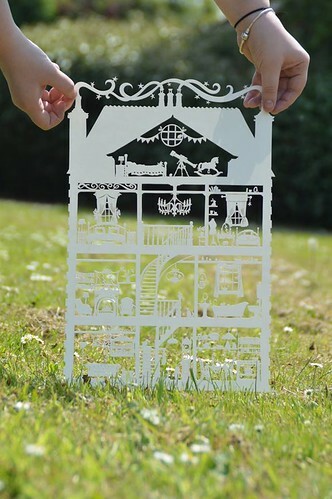 She was an explorer of many crafts over the years, but it wasn't until Louise and her husband Ryan, who is also an artist with whom she frequently collaborates, received a scherenschnitte design as a wedding gift, was she inspired to give paper cutting a try. Working with small scissors did not go well, but as soon as she switched to a scalpel, a new creative path was forged. Louise admits to many long hours hand drawing or digitally creating designs which she then carefully cuts with a sharp blade. She enjoys teaching too and creates DIY kits that help others learn to cut paper. Once you're past the early stage, you'll find additional cutting templates available as instant downloads via her Etsy shop, Paper Panda Papercuts. 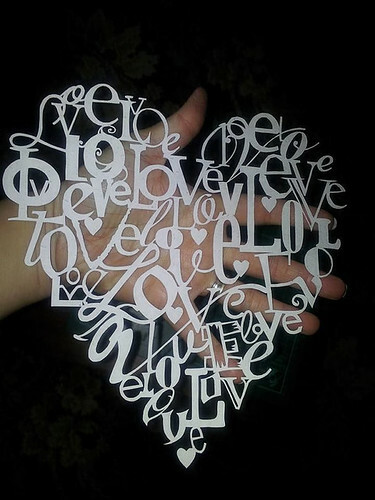 The Love cutting (above) is one example. 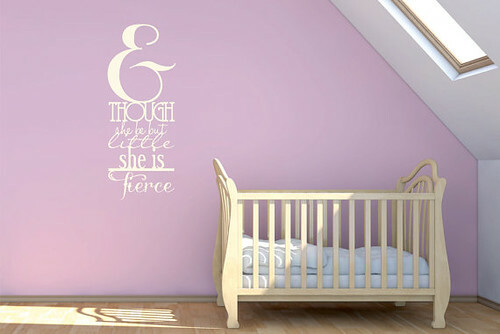 Many of her cut paper designs have been transformed into home items and giftware, such as vinyl wall decals, prints, cards and more. But back to the Paper Panda Facebook page... I've long noticed there are many paths that can be taken in the running of an online creative business. Louise's method is one that has been a successful whirlwind ever since it launched in 2010. She encourages others who are just starting out to interact often with readers as a way of networking. Even though Louise doesn't have an official website other than her blog and shops, there are more orders than ever, due in large part to her FB page that practically hums with activity... you'll find giveaways, contests, and special sales that involve customer interaction. One marketing idea that goes over especially well is Tiny Tuesday. 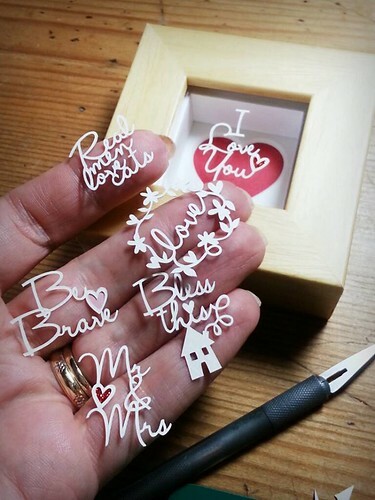 Louise creates a unique batch of super-small and super-cute handcut phrases and places them in little float frames. These are offered hourly throughout the day and are quickly snapped up. How does she do all this, you must be wondering? For a long while Louise handled everything herself, but now she has wisely turned over the page's management to three helpers who take care of replying to the many comments and questions. Otherwise I can't imagine how she would ever get any papercuts done! To learn more about Louise's cutting process, enjoy this recent interview over at UK Handmade. 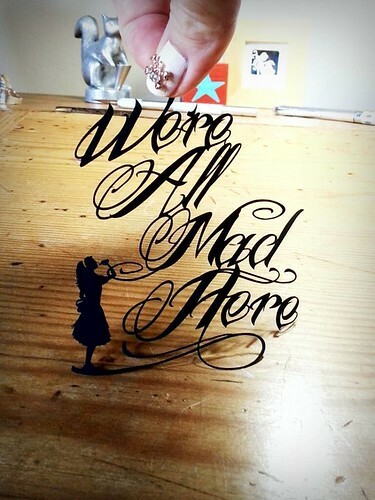 these papercuts are truly amazing, thanks for sharing ! Her work is simply gorgeous. So tiny and so beautiful. So inspiring, I hope I can learn this beautiful art someday.